Raith Rovers manager Barry Smith is still looking to add to his squad after completing the signing of Lewis Milne from Montrose. Smith remains in discussion with a number of players, with a recently released Championship midfielder, who can also play defence, currently locked in talks having joined the club for pre-season training yesterday (Wednesday). “We’re still looking at all positions,” Smith told the Press. “We’ve got a number of players in mind and we’re just trying to get them over the line, which is the most difficult part. Smith is also running the run over a number of trialists in training, who will be given the chance to impress in upcoming friendlies. “We’ve had a couple of boys in on trial since the start of pre-season nearly two weeks ago,” he confirmed. Milne became the fourth new arrival of the summer this week, signing a one-year contract with the Kirkcaldy club. 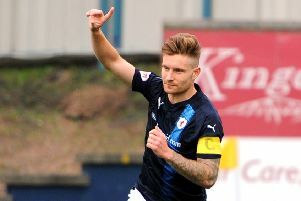 Smith was delighted to secure the 24-year-old midfielder, who netted 11 times in 13 starts to help Montrose win the League Two title last season. “We had Lewis in training with us last year, he’d just come back from playing in Australia,” he said. “We liked what we saw, we just didn’t have the finance to bring him in. He eventually went to Forfar and Montrose and we kept an eye on him. He impressed us enough to make him an offer and we’re delighted to have him on board. “He’s got a very good attitude. He’s an attacking midfielder whose scored goals and we’ll be looking to use that abillity to enhance the squad. “There was a clause in his contract which allowed him to speak to full-time clubs, but we want to thank Montrose for the way they handled it. “I’ve got a good relationship with Stewart Petrie, who speaks very highly of Lewis and what he’s done for Montrose since he went there in January. “He will complement the midfielders we already have at the club, and while he is primarily an attacking midfielder, he can play in a couple of positions, which is important in a small squad. Raith will play their first pre-season fixture this Saturday in a closed doors match against Partick Thistle. The first friendly open to supporters follows on Wednesday as the club hosts Dunfermline Athletic at Bayview, kick-off 7.45 p.m.
Smith added: “Guys have been worked hard through pre-season but nobody is flagging up,” he said. “Some are a wee bit behind in the schedule because they joined us a bit later, and we have to make sure they are up to the physical side of it before we throw them into games. “We don’t want injuries when running with a small squad so some might miss out on a couple of games just because of where they are in fitness terms, but that’s normal.